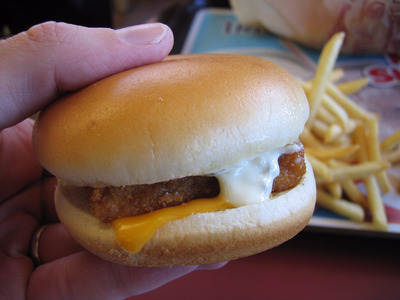 Flickr/Kevin O’MaraPlay it safe this Lent with McDonalds’ Filet-o-Fish sandwich which is Lent-approved. Lent starts Wednesday which means that many Catholics will be abstaining from eating meat on Fridays. Business Insider has confirmed that several fast-food restaurants are using beef oil to cook seemingly Lent-friendly products such as fish and fries. McDonald’s has been sued for using this oil in the past. Beware of fast food this Lenten season. We called several fast-food restaurants across the US who confirmed that they use beef oil to cook products in their restaurants, putting conscientious Catholics in danger of breaking no-meat Fridays during Lent. For instance, Captain D’s seafood chain is advertising a special Lent menu this year: The Flounder Feast. We called several of its restaurants across the US who confirmed that it uses beef tallow, which is made from rendered animal fat, in some of its restaurants. Captain D’s did not immediately respond to Business Insider’s request for comment. Other Captain D’s locations that we called in Texas and Memphis, however, said soybean oil is commonly used. McDonald’s was sued in the ’90s for using meat tallow to cook its fries. The lawsuit cost the chain $US10 million; it now cooks with vegetable oil. While the Catholic church does not consider beef oil to be the same as eating meat, it is still a concern for people practicing Lent. David Wood, director of worship at the diocese of Austin, said people should steer clear of these products. “My impression is that the church doesn’t get that specific, but I think generally the answer should be that they probably shouldn’t be eating it,” he told Business Insider. “However, moral theologians have traditionally taught that we should abstain from all animal-derived products,” it said. “Catholicism is not supposed to be a legalistic religion, and so I would say that eating a non-meat food that was cooked in meat fat would be fine,” Michele Dillon, a professor of sociology at the University of New Hampshire told Business Insider. If you want to err on the side of caution, call your local restaurant ahead of time and find out exactly how its products are cooked.